In OS X 10.7 Lion, Apple added a new file-sharing feature called AirDrop that let you easily share files with other Mac users nearby—specifically, those with recent Macs running Lion with Wi-Fi enabled. Though AirDrop wasn’t (and still isn’t) effortless, it’s a convenient option for sharing data with people in close proximity. In iOS 7, Apple has brought a version of AirDrop to all iPhone 5 models, the fourth-generation iPad, the iPad mini, and fifth-generation iPod touch models. You also need an iCloud account to use Contacts mode (see below). Assuming you meet those requirements, you’ll be able to use AirDrop to share data with people nearby whose devices also fit the bill. Out of the box, iOS 7 offers AirDrop as a way to share photos in the Photos app, contact cards in the Contacts app, notes in the Notes app, URLs in Safari, Passbook passes, app listings on the App Store, media listings in iTunes, and stations in iTunes Radio, to name a few examples. Once third-party developers start integrating AirDrop sharing, you’ll also start to see the feature in many other apps. Though using AirDrop is simple, there are a few settings you can tweak to customize how the feature works. 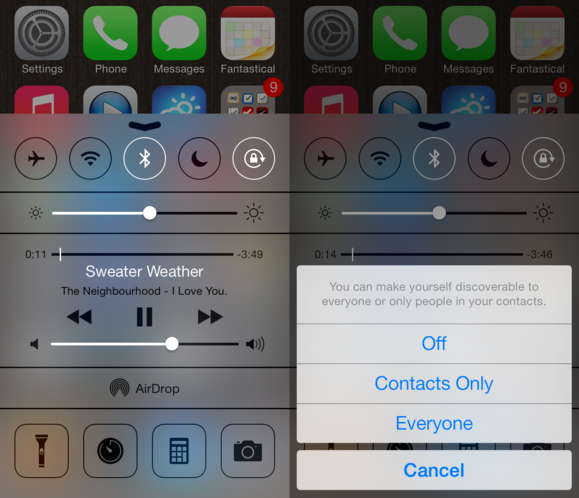 For starters, when you access iOS 7’s Control Center and tap the AirDrop item, you can choose whether your device is discoverable (that is, visible to other AirDrop users) to everyone, just people listed in your contacts, or no one. Note that the Contacts Only setting requires that you be logged in to your iCloud account (in the iCloud screen of Settings), as AirDrop uses your iCloud-synced contacts list. In addition, your device must include the other device’s primary Apple ID in his or her contact record. By tapping the AirDrop button in Control Center (left) you can choose who can see your device for AirDrop transfers (right). If you’re managing an iOS device with restrictions enabled, iOS 7 also includes a new restriction for disabling AirDrop that overrides the Control Center setting. In Settings > Sounds, you can also choose the alert sound you hear when someone tries to send you data using AirDrop. Tap the person’s icon, and he or she sees a preview of the item and a request to accept it. (Unlike in OS X, users don’t have to first open a special AirDrop window each time they want to make themselves available.) Assuming the recipient does accept, the item copies from your device to theirs. You see a confirmation on your device once the transfer is complete; the recipient’s device then launches the app that handles the type of data you’ve shared. Tap a visible AirPlay recipient in any Share view (left), and they’ll be prompted to accept whatever you’re sending (right). Which app is that? Whichever app handles the type of data being sent: iOS saves AirDrop-received photos to the Camera Roll album in the Photos app, contact cards to the Contacts app, and notes to the Notes app; it opens iTunes Radio stations in iTunes; and so on. Alas, even though OS X and iOS both now support AirDrop, you currently can’t use AirDrop to share stuff between iOS and OS X. How does AirDrop work? Interestingly, it requires that you enable both Wi-Fi and Bluetooth on your device. We suspect this is because Apple is using an approach similar to that enabled by Bluetooth 3.0 + HS. This technology allows two devices to use Bluetooth to establish a secure, direct connection, and then hands off the actual data transfer to Wi-Fi for faster performance. Given that all iOS devices that support AirDrop include Bluetooth 4.0LE, it’s likely that Apple is using Bluetooth 4.0’s low-power mode for discovery, and then Wi-Fi for actual data transmission. In other words, when you tap AirDrop in a share sheet, your iOS device does a quick check for other devices broadcasting, over Bluetooth, their availability for AirDrop connections; iOS displays any such devices in the share sheet. Tap one, and that device and yours initiate a direct Bluetooth connection. Assuming the recipient agrees to the connection, the two devices then switch to Wi-Fi for the actual transmission of the shared data. 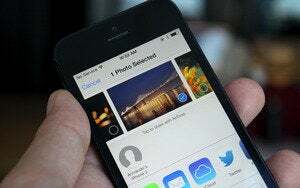 (During June’s Worldwide Developers Conference keynote, Apple stated that AirDrop transfers are encrypted for security.) Apple hasn’t officially confirmed the details of this process—we’re speculating here based on what we know and what we’ve found in our testing. Updated 9/18/2013, 10:30am, to correct an error about Wi-Fi. Updated 9/19/2013, 2:15pm, to clarify the iCloud requirement and to correct an error about the AirDrop icon in the sharing sheet.